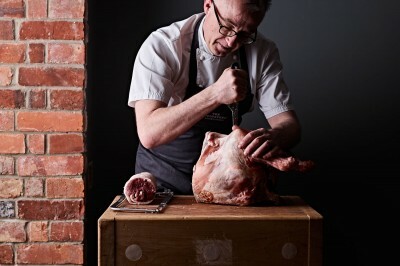 Our butchery course is very hands on, we believe that a good understanding of traditional butchery skills give the cook an advantage for getting the most out of each cut. We’ll breakdown a pork carcass in front of the class, explaining the cuts as we go along and the best cooking method to use to maximise the most out of the cut. The day also covers stock, confits and stuffing, a must for anyone interested getting the most out of their meat cookery. • Demonstration of boning a side of pork and uses of the joints with recipes for each joint. To take away: Some of the food cooked on the day and all notes and recipes. Spaces for this course are subject to minimum number of participants. To ensure tickets are delivered safely and securely and to keep the price as low as possible for you, the ticket buyer, The Woodspeen generally uses our E-ticket system unless otherwise stated. When you purchase tickets through The Woodspeen, the full face value of the ticket is shown. This price is the price set by the event promoter and we pay this full amount to the promoter without any deductions.